The unit of certification is a woodland management unit (WMU). A WMU is a clearly defined woodland area, or areas, with mapped boundaries, managed to a set of explicit long-term objectives. The WMU is covered by the management planning documentation set out in section 2.2 of the certification standard. Elements of management planning documentation may apply to a specific WMU, or may be set at a higher level (such as group schemes, or state forest services) and apply to multiple WMUs. For example, a WMU might be a single ownership incorporating several areas of woodland that are managed within a woodland management plan; several separate ownerships managed within a woodland management plan; a community-managed forest; a management subdivision of a national forest service such as a forest district covered by a woodland management plan. In large and/or widely geographically dispersed WMUs, the spirit of the certification standard and any best practice should be conformed to throughout the WMU. Note: The terms ‘woodland management unit’ and ‘forest management unit’ are synonymous. Not all requirements will be applicable to every WMU, for example requirements relating to plantations on ancient woodland sites can only apply if such sites are present. While all applicable requirements must be met, there may be flexibility in exactly how requirements are fulfilled. Any different approach taken must be an equally or more effective way of achieving the objectives intended by the requirement. The impacts of the approach taken shall be carefully monitored and recorded. The certification body carrying out the audit shall make a professional judgement as to the acceptability of the flexibility (see Interpretation of the certification standard). See also ‘Using the certification standard’ regarding flexibility in verifiers (see definition of example verifiers in that section). The establishment of research trials or plots may be undertaken only in the context of a research policy and should conform to the spirit of the certification standard. Traditional rights (e.g. peat cutting). The third-party rights have not been created intentionally to avoid conformance. 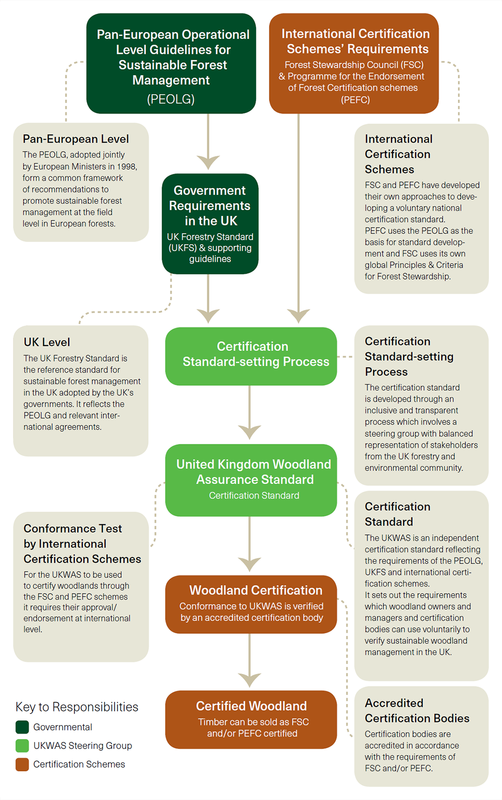 Certification schemes may have their own requirements which apply when the owner/manager does not have full management control of a woodland management unit. A special feature of woodland management is its long-term nature. Decisions made in the past have a strong influence on the woodlands of today. Therefore, when assessing conformance with the certification standard, certification bodies will not evaluate woodlands solely on the present structure and layout, but will consider the plans for management in the short, medium and long term. Where present structure and layout fail to meet the requirements, woodland owners/managers will need to demonstrate through management planning documentation and ongoing activities in the woodland that they are taking active measures to achieve conformance with the requirements. They will also need to demonstrate that there is a time frame for achieving full conformance based on sound management principles. Further guidance on how non-conformities are dealt with can be obtained from certification bodies or group scheme managers. Woodland management units vary in terms of the scale and intensity of management and the risk of negative impacts. While the principles remain the same regardless of woodland size and intensity of management, the level and complexity of management needed to meet the requirements of the certification standard, and the nature of the evidence to demonstrate conformance, may vary depending on the size and type of the woodland management unit. Certification schemes have different sampling intensities depending on the scale and intensity of management and operations. In drafting this standard, every effort has been made to ensure that requirements are sufficiently flexible to apply to all scales and intensities of management. In the UK context, scale has not been found to be closely correlated with intensity or risk of woodland management; for example, many large operations may be in woodlands with relatively low environmental or social values, while the potential impacts of operations in those small woodlands which have higher environmental and social values may be commensurately high. As such, it has not proved possible to define a threshold or specify different requirements for lower potential impact operations, although this will be subject to review in future revisions of the standard. However, it is considered appropriate to specify different requirements for higher potential impact operations, and some of the requirements of this standard apply only where the entity holding or applying for certification, and therefore responsible for demonstrating conformance, is a large enterprise, as defined in the glossary. Individual certification schemes may have specific requirements regarding the official version of this standard to be used by auditors. Certification bodies should check with the relevant scheme.